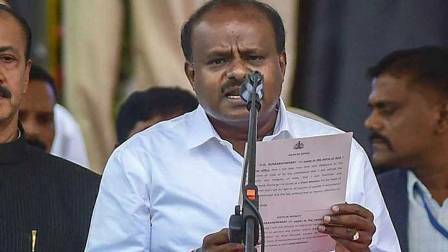 BENGALURU: Karnataka Chief Minister HD Kumaraswamy today announced a loan waiver scheme for farmers -- a key promise ahead of assembly elections amid farmer suicides and countrywide protests. The waiver, which would cost the state Rs. 34,000 crore, would apply to crop loans of up to Rs. 2 lakh. Besides, arrears will be waived for defaulters so they can get fresh loans. For this, the Chief Minister said, Rs. 6,500 crore has been earmarked in the 2018-2019 budget. There are incentives for farmers who repaid loans in time. "I have decided to credit the repaid loan amount or Rs. 25,000, whichever is less, to each farmer's account," Mr Kumaraswamy said in his budget speech. The Chief Minister has also proposed to increase power tariff by 20 paise per unit and levy a higher tax on fuel. Petrol fare will go up by Rs. 1.14 per litre and diesel by Rs. 1.12 per litre. "I also propose to increase excise duty on Indian made foreign liquor by 4 per cent to raise additional revenue for meeting the budget expenditure," said Mr Kumaraswamy. Goldberg retires after Raw goes off the air?